The Fujitsu D3544-S is a very small, yet surprisingly robust platform. The mini-STX form factor means that it is only 140mm x 148mm in size. At the same time, it is a passively cooled quad-core platform with low power consumption and plenty of I/O. We are going to take a look at the top end variant, the Fujitsu D3544-S3 to see what this low power platform can offer. The Fujitsu D3544-S is a diminutive platform. It measures only 5.5″ x 5.8″ which is almost a 30% smaller footprint than mITX at 6.7″ x 6.7″. 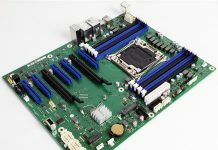 The platform supports a Gemini Lake series SoC along with a single SODIMM slot that takes up to 16GB of DDR4-2400. For our test, we are going to test the third variant or the Fujitsu D3544-S3. 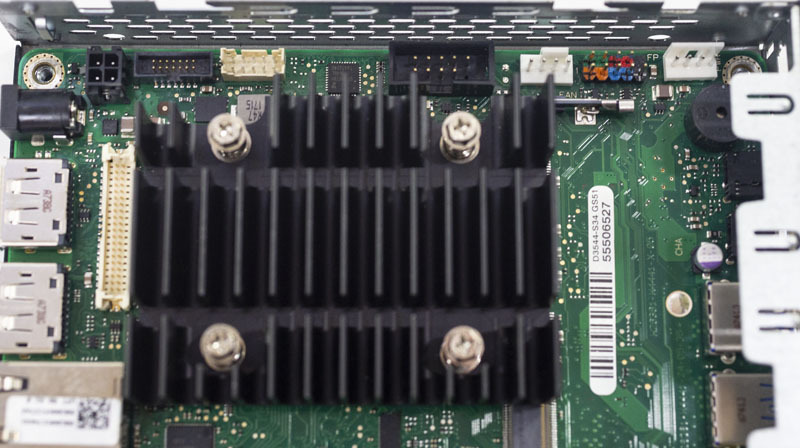 For a compact and fanless appliance, the onboard Intel Pentium Silver J5005 quad-core SoC provides plenty of performance. We can understand why some may instead look for even lower power and less expensive parts. 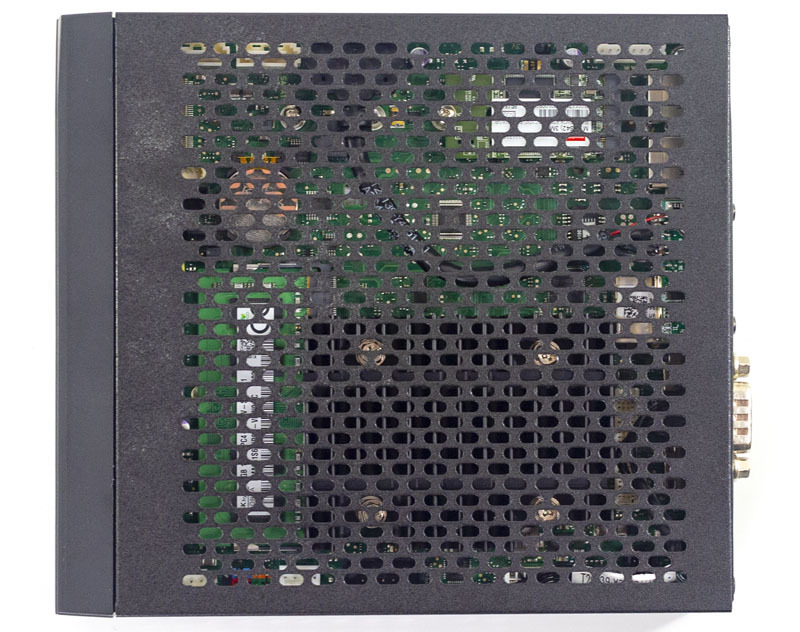 This Intel Pentium Silver J5005 includes an 18EU Intel UHD 605 GPU which means it can easily drive dual 4K display outputs which are great for kiosks, digital signage, and even as low power desktops or thin clients. For our testing, we also had the Fujitsu SMARTCASE S500 chassis with a matching passive heatsink. You are going to see the Fujitsu D3544-S3 in this chassis throughout our review. For storage, there are two SATA III 6.0gbps ports. Next to these, there is a M.2 Key B socket (2242 / 2260 / 2280) that can handle a SATA III SSD or a PCIe x1 NVMe device. The other M.2 2230 module is designed for use with WLAN/ Bluetooth. 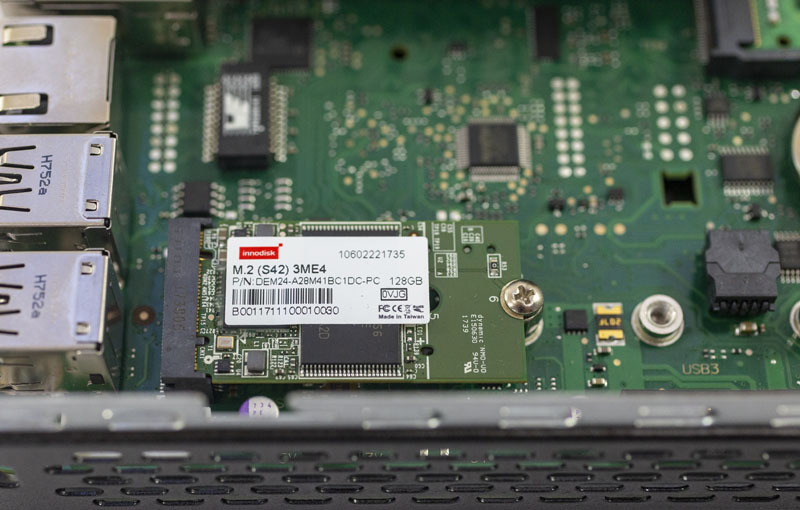 In our test system, we had an Innodisk M.2 (S42) 3ME4 SATA SSD. This is a 128GB DRAM-less unit which worked well during our testing. There are a surprising number of headers onboard. These cover fans, COM ports, audio and USB ports among others. Power input is via DC power. Our unit was supplied with a Fujitsu PSU which worked well. The downside here is that the unit requires an external power brick. The benefit is that this keeps the design small and power efficient. 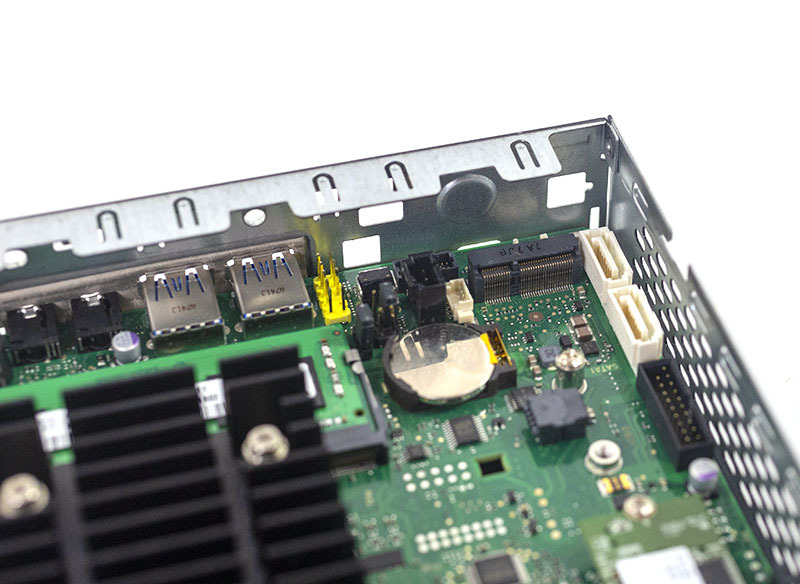 For some sense of how the internal connectors work, here is an example of putting the Fujitsu D3544-S into the S500 chassis. Here we have a cable providing the 9-pin COM header to the rear panel. 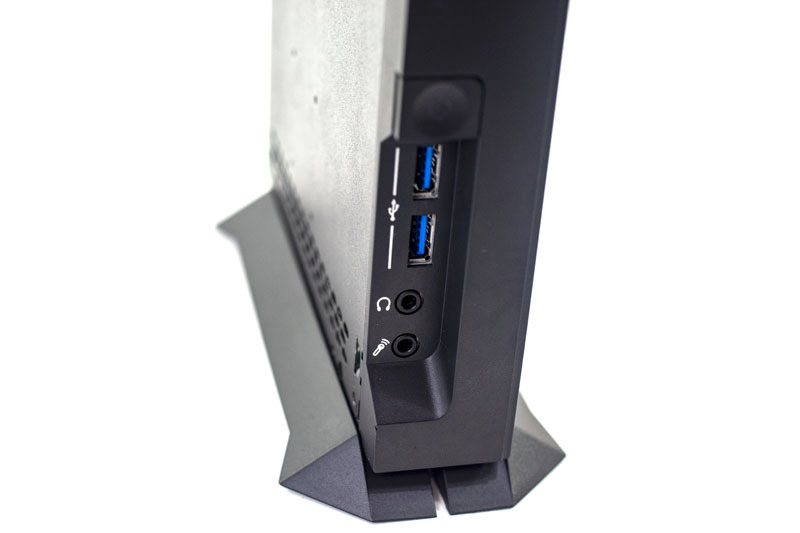 We also have a USB 3.1 Gen1 port via a cable that screws into the chassis. This type of layout means that one can customize the chassis design around the D3544-S. Assembled, the unit has a robust rear panel I/O assortment. 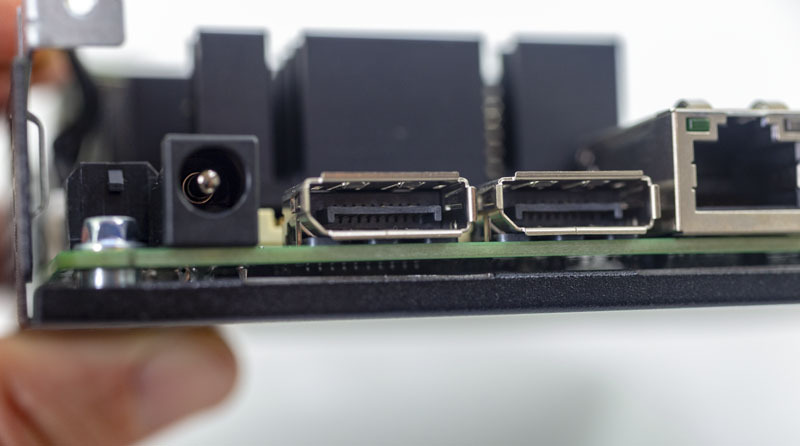 Beyond the COM and USB 3.1 ports, there are two DisplayPort headers each capable of 4K 60fps output. There are four USB 2.0 ports as well. Two 1GbE ports are powered by two different network controllers. One is powered by an Intel i210 and the other by a Realtek RTL8111G. We would have preferred if both were Intel i210 NICs, however, we understand given the cost and thermal constraints why Realtek is used. The inclusion of even a single Intel i210 NIC in this class of product is impressive. Put together in the S500 chassis, one can see a fanless model without moving parts. The large heatsink and chassis perforations enable airflow even in the tight quarters. Moving to the front of the chassis there is a power button, two USB 3.0 ports, and headphone/ microphone ports. Onboard audio is provided by the Realtek ALC671 5.1-channel CODEC. The Fujitsu SMARTCASE S500 is a solid feeling unit. It comes with two “feet” that ensure the entire chassis gets airflow. We were pleasantly surprised by the versatility of this design either allowing horizontal or vertical orientation. This solution was both simple and elegant in its execution to the point that we are surprised more vendors to not use a similar design. Fujitsu also offers VESA mounting if you want to mount the unit behind a display. Next, we are going to look at the test configuration and topology before we get to power consumption and our final words. 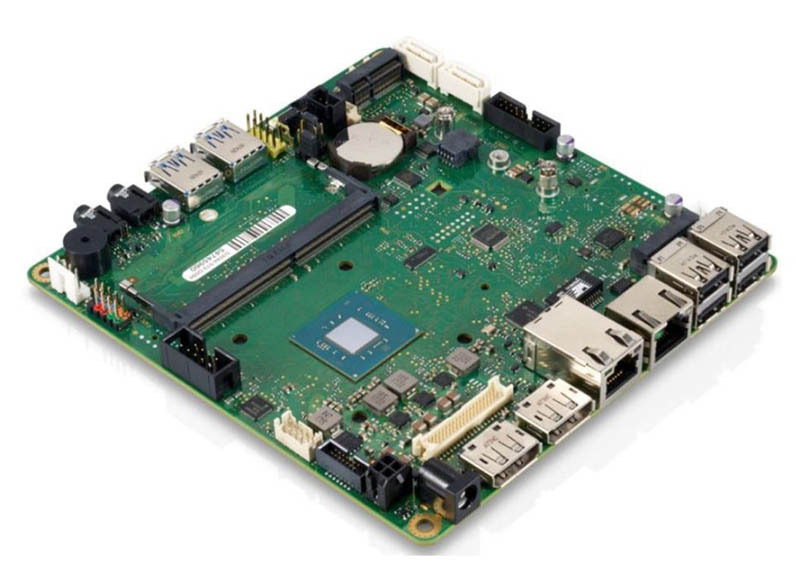 Our Fujitsu D3544-S review shows how this industrial mini-STX platform excels in the embedded space with solid performance, great features, and fanless operation. Pity that it does not support ECC RAM. IMHO for majority of industrial usage, this is a must have feature. Otherwise board looks fantastic. You could say that again. 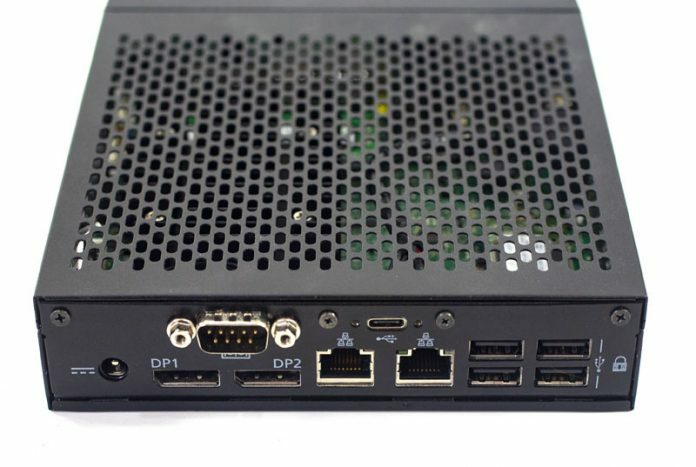 With a pair of intel nics this could be a great candidate for smb pfsense box. Also curious on OpenSSL testing – is AES-NI is used by default? I do not like the growing reliance starting about 10 years ago by manufactures and for the sake of “cost reduction engineering” to remove the physical hard switch for completely turning off the power to a device, low voltage or not, thus not unplugging a live source to perform the task of full electrical power shut down. I learned from intense formal education in US Navy schools to decades of hands on mentoring by those many years my senior (knowing well from practice what is improper and why), to myself being a former instructor for Basic Electricity and Electronics, to having years of experience with integrated applications where access is not practical, such that the user method of physically unplugging a device as a means to turning off the power, is not a good electrical engineering practice. Most receptacles that are for low voltage DC are not designed with the intent to be used as the principle means to turn on and off a device. That is why even though low power DC and AC, external power supplies with generic use certifications have been packaged for many decades to avoid having to test a high voltage (110AC) circuit and related power supply for newly designed low power appliance, had a hard switch, not just a momentary, state change, switch. 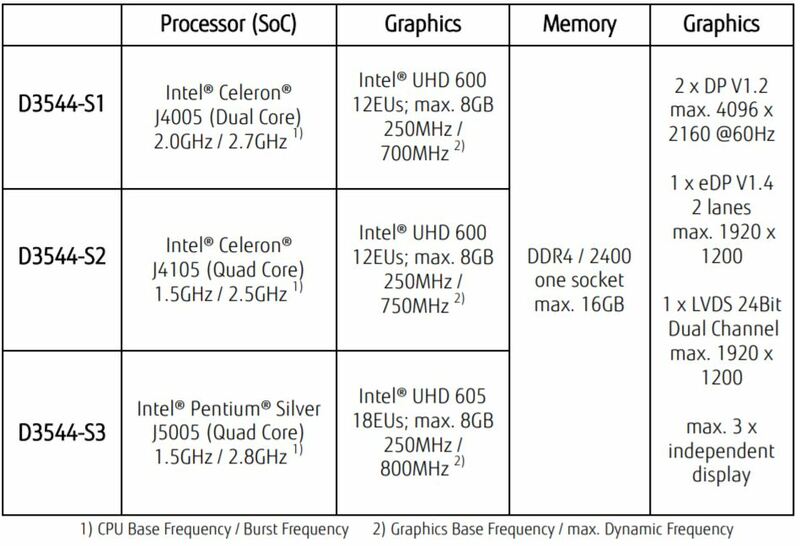 Why the aren’t any numbers in the benchmarks?! This isn’t serious because I can’t compare them to my current machines… Please fix this. It does mention in the article that they don’t provide all the data that they collect because they also provide consultancy and testing services. We don’t pay for STH so they can provide whatever they like, if it’s business critical for you to know the numbers then you could always contact STH and get them? 2. 1080p gaming rig with 17-21w idle on w10 desktop with Quadro P1000+1x nvme+2x5Tb slim hdd+wifi. @Laugh|nGMan You are comparing apples to oranges. 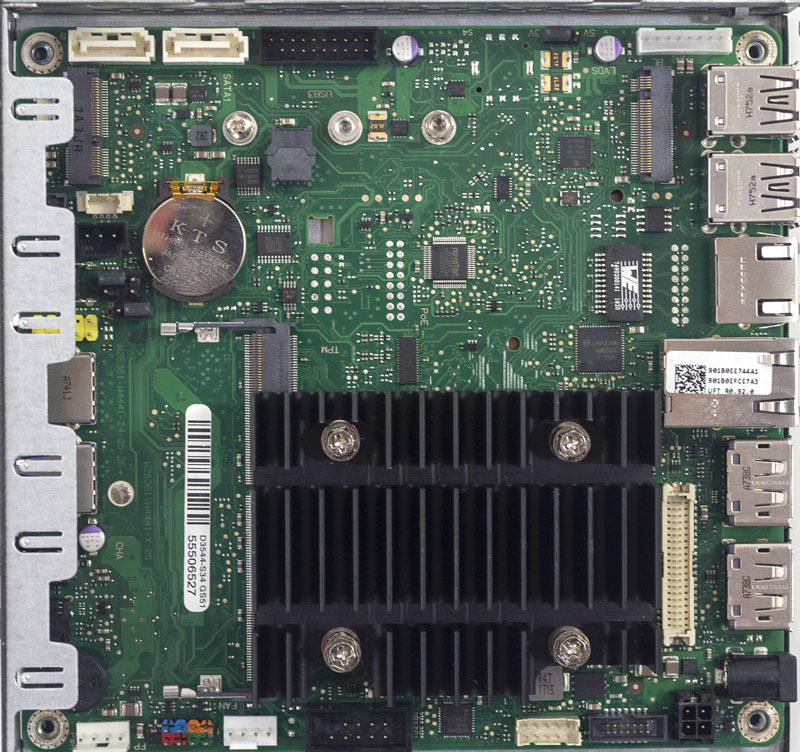 The J5005 is embedded and has 6 PCIE 2.0 lanes. The Q170 chipset has 20 PCIE 3.0 lanes, of course its going to be more flexible. As with the sketchier very small format devices available from direct from China vendors like Qotom, the lack of a second DIMM slot is a disappointment, as these SoCs all support Dual Channel RAM — a lot of that bus bandwidth and multicore capability is wasted when you can’t use it. It should also be noted that the Qotom and similar routinely include a pair of Intel i211 NICs in a passively cooled case and heat is not a problem. Intel i-series NICs aren’t remotely the kind of fireballs they were in the pro/1000 era when you absolutely had to have air moving over them. Sort of surprised there is no HDMI option for flexibility. @Park McGraw I completely agree with you. I believe that this is the sort of thing that is used a cost-cutting measure. The absence of real power switches on electrical devices these days is worrying, and I think this is a good prompt for me to further improve my soldering skills.